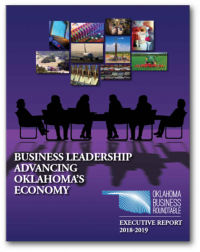 Joe Brusuelas, Chief Economist for RSM US LLP was the keynote speaker for a special Roundtable Executive Briefing on February 20th at the Oklahoma History Center in Oklahoma City. Over 120 members and guests were in attendance. Brusuelas provided a brief but comprehensive global and U.S. economic forecast based on growth of 1.8% with downside risk. His current outlook for 2019 includes: growth deceleration with risks around trade deficits and business investment, uncertainty over trade policy, slowing of growth (after the recent tax cuts), challenging business outlays on capital expenditures (software, equipment & intellectual property) and modest household spending.